WARDAK PROVINCE, Afghanistan — The screen at the head of the two tables in the oper­a­tional coor­di­na­tion cen­ter here dis­played sta­tis­tics about coali­tion and insur­gent activ­i­ties in the area. Mem­bers of the Afghan secu­ri­ty forces lis­tened as one of their coun­try­men briefed the data. Army Lt. Col. Lar­ry Daley lis­tens dur­ing a con­fer­ence with mem­bers of the Afghan nation­al secu­ri­ty forces April 5, 2011, at the oper­a­tional coor­di­na­tion cen­ter in Afghanistan’s War­dak province. Daley coor­di­nates the efforts of Afghan forces in the province. Seat­ed qui­et­ly at the table, U.S. Army Lt. Col. Lar­ry Daley lis­tened to his inter­preter trans­late the fruits of his team’s labors. Daley says his job as senior U.S. advi­sor for the oper­a­tional coor­di­na­tion cen­ter here is the future of the coali­tion pres­ence in Afghanistan. 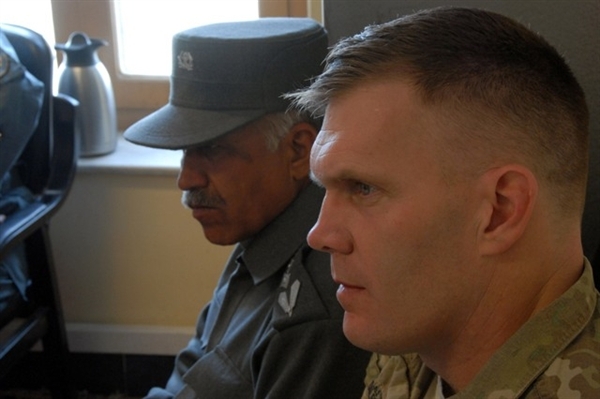 The Pre­ston, Minn., native, who is attached to the 4th Brigade, 10th Moun­tain Divi­sion, Task Force Patri­ot, has worked since Novem­ber to fos­ter bet­ter coop­er­a­tion among the Afghan secu­ri­ty forces com­po­nents in War­dak province and to improve their abil­i­ty to han­dle secu­ri­ty. Daley’s posi­tion in War­dak came about by order of Afghan Pres­i­dent Hamid Karzai, who estab­lished the a sys­tem of oper­a­tional coor­di­na­tion cen­ters in Afghanistan’s provinces. Orig­i­nal­ly, the cen­ters coor­di­nat­ed efforts relat­ed to elec­tions and nat­ur­al dis­as­ters, but they worked too well to stay with­in such nar­row para­me­ters, Daley said. “It has evolved into a way that all of the enti­ties of the Afghan nation­al secu­ri­ty forces can be inte­grat­ed for oper­a­tions and have a uni­ty of effort in secur­ing the pop­u­la­tion,” said Army Lt. Col. Michael Kel­ley of New­nan, Ga., the coalition’s region­al oper­a­tional coor­di­na­tion cen­ter com­man­der for south­ern Afghanistan and senior advi­sor. The coali­tion pres­ence in the cen­ters is in an advi­so­ry capac­i­ty, Kel­ley said, help­ing the Afghan secu­ri­ty forces work togeth­er and share infor­ma­tion, he said. Brig. Gen. Muham­mad Daood, an Afghan army offi­cer who serves as region­al oper­a­tional coor­di­na­tion cen­ter com­man­der for the south, said he is encour­aged by the growth of coop­er­a­tion among Afghan forces in his area. “I hope one day we’ll be able to pro­vide secu­ri­ty in the whole province,” he said through an inter­preter. To get there means a lot of drink­ing for Daley. “A lot of late-night chai ses­sions is how you get it done,” he said. Chai, or tea, is a means of over­com­ing a prob­lem that some­times shows up in orga­ni­za­tions: a lack of com­mu­ni­ca­tion. The var­i­ous branch­es of Afghan forces have not been shar­ing the data they col­lect in War­dak, Daley said, not­ing that that the U.S. mil­i­tary was no dif­fer­ent before the 1980s. Before con­gres­sion­al action forced joint­ness on the ser­vices, he explained, each U.S. ser­vice had its own set of data and did not nec­es­sar­i­ly share it with the oth­ers. Daley said drink­ing tea, a ubiq­ui­tous cus­tom in Afghanistan, helps him to devel­op per­son­al rela­tion­ships. By estab­lish­ing friend­ships and respect among the rep­re­sen­ta­tives of the Afghan secu­ri­ty forces branch­es, he added, he is able to improve coop­er­a­tion. Daley recent­ly began teach­ing Afghan per­son­nel how to ana­lyze data and ask what is caus­ing those sta­tis­tics. The result, he said, was a desire on the part of some Afghans to learn more.